Graeme: Congratulations on making the finals of this award. What would you to do with the $10,000 that is allocated to sponsor a project of the winner’s choice? Elise: I would use it to develop a handbook for biological farming with an emphasis upon soil microbes and the strategies needed to nurture them. Graeme: It is an interesting chicken and egg debate about which is more important, minerals or microbes. There are microbiologists out there suggesting that all we need to do is re-instate soil biology and the job is done. In actual fact, decades of extractive agriculture has compromised more than the biology. You can’t take off seventy minerals with each crop, replace three of them and not expect a consequence. What is your position in the minerals vs. microbes debate? Elise: I always suggest that my clients start with a soil test as this is science to which they can readily relate. However, fertility is a two way street and we can’t ignore either. I love soil microbes and have been working with Dr Mary Cole who specialises in beneficial fungi. Graeme: Has it been challenging to be trying to promote a new approach to older male farmers who are set in their ways when you are both young and female? Elise: I can’t deny that it has been a difficult challenge with that double hurdle but I have found a hunger out there for honest, independent opinion. They soon pick up on my passion and my commitment to the industry but they often check my credibility and I have to jump through more hoops than most. Graeme: It is heartening for me to see the huge upswing in interest in the biological approach in recent years. 18 years ago we would attend Ag shows and there would only ever be a couple of us flying the flag. Now there are more bio ag companies than chemical companies at these events. Have you found it difficult operating amongst all of this competition? Elise: I am more concerned for the farmers than myself because there is sometimes a negative side to the increased competition. They go to a field day and constantly hear different stories. It is so confusing for them. For some reason many in the industry have reverted to bagging their competitors and this kind of negativity invariably backfires and reflects negatively on the entire industry. Graeme: I couldn’t agree more. There is really only one story, although there may be different roads to Rome. It is critically important that the industry band together and present a united front without petty rivalry. The message is too important and the clock is ticking. I think growers soon come to realise if you are more concerned about your own profits than their welfare. If you are genuine in achieving the best possible outcome for your client they will soon realise where you are coming from. How do you break the ice when visiting a new grower? Elise: We check their soil test and associated soil structure and then we look at where they are now and where they want to be. It is important to evaluate their expectations and to be realistic about goals, but establishing a baseline is the best starting point. Graeme: There are simple, inexpensive strategies using humates and microbes that can rapidly improve profitability but balancing soil minerals is often a long term proposition, particularly when there are budgetary restrictions. Elise: Yes, you need short term and long term goals. We need to always be up front about time frames. Graeme: I understand that your attendance at the four-day Certificate in Sustainable Agriculture course was a turning point in your career. It is amazing how often this course has had this kind of life changing impact on growers and consultants around the globe. It is such a rewarding thing to be part of. Elise: Yes. I started to conceptualise a new path during the four day course but after completing the Master Class I was really inspired to turn a dream into reality. I was impressed with the backup support NTS offers with the entire organisation and this helped with my confidence. Graeme: What is the major challenge facing farmers in your region? Elise: Flood recovery has been the main issue this past year. It’s been all about correcting anaerobic soils and leached nutrition. Graeme: It has been similar issues in Queensland although loss of top soil has also compounded problems here. Humus rich soils invariably do best in terms of nutrient retention and they rebound much more rapidly, but the torrent was so intense in some areas of Queensland that it took all before it, including some of the best top soil in the world. One of our lucky growers actually gained forty feet of top soil in one valley, but most of it ended up in the ocean. Anyway back to my questions. A well founded, fear of recession that has been impacting all industries. Have you seen much impact in agriculture? Elise: Most definitely. There is so much caution out there. Some see a move into biological agriculture as having an element of risk and there is no appetite for risk at all at present. Graeme: It is understandable that you would choose to stick with what you know in times of uncertainty but, in actual fact, this is when it is critical to investigate new tools to improve your growing skills and bottom line. When the going gets tough... in my opinion simple little tricks like seed treatment, inoculation with mycorrhizal fungi and inclusion of soluble humate granules with fertilisers become no-brainers in tough times. The whole package can cost less than $10 per hectare and it is a big return for a small investment. 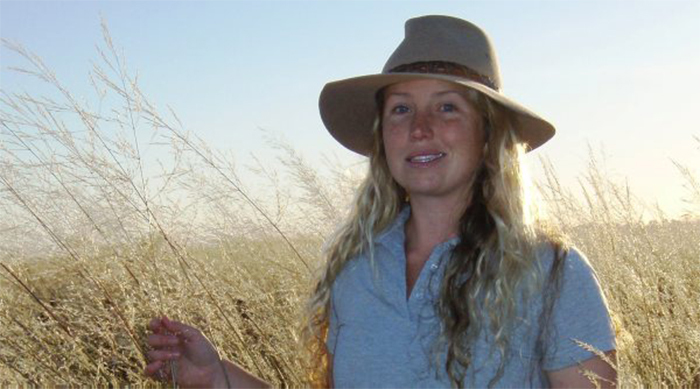 Elise: How could a broadacre grower use those three inputs for just $10 a hectare? Graeme: We had wonderful results last season inoculating our Nutri-Life Platform® product (mycorrhizal fungi) into wheat crops at planting, at a cost of just $5 per hectare. Soluble humates magnify fertiliser response so reliably, that we have found it safe to suggest that fertiliser use can be slightly reduced to account for the cost of the soluble humates. For example, 5 kg of NTS Soluble Humate Granules™ per hectare is very productive. This costs around $13 per hectare, so you use $13 less fertiliser to cover the cost. The humates essentially become a cost-free exercise. I have never seen anyone who did not do better with the humate additive. Our Seed-Start™ seed treatment costs between $2 and $4 per hectare depending on the seed involved but essentially this gives you a simple three pronged strategy for just $8 or $9 per hectare. Graeme: Sorry about that, I can’t help myself. Small changes can be so cheap and yet so productive. We all wish you every success in the Rural Women’s Award. Keep up your great work. Thanks for the talk.